La Madeleine Smart Choice Omelet is the perfect breakfast for when you are watching your waist line. Sometimes it is really difficult to find a good breakfast when dining out, and trying not to go overboard. This breakfast will set you back approximately 350 calories, and about 8 Weight Watcher points when following the Points Plus plan. Has your breakfast become boring? Are you looking for something other than cereal for breakfast? When dieting it is often really difficult to find the perfect breakfast. Sometimes an omelet is a perfect dinner. I know when I get home from work, sometimes I wished food cooked itself, and I don’t want to spend too much time cooking because I want to do something other than cooking dinner when I get home. 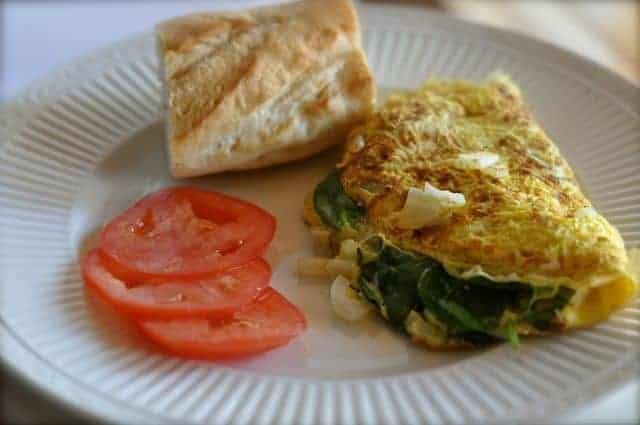 This omelet is perfect if you are on Weight Watchers, if you let the bread out of this, you would only spend 3 points for this meal. If you like other vegetables, you could use other things than my favorite of mushrooms, onions, and spinach. In fact, you might have other great ideas to add to this omelet. The La Madeleine Smart Choice Omelet is a great light breakfast that you can recreate at home. Using an 8-inch non-stick skillet, coat heavily with non-stick spray and add onions, and mushrooms. Season with salt and pepper. Cook onions and mushrooms over a low heat until the onions are transparent. Pour Egg Beaters overcooked onions and mushrooms, and then sprinkle with spinach and allow the eggs to cook fully. When the eggs are done turn omelet over onto itself and allow the spinach to steam for a moment or two before serving. Service with fresh tomato slices, and serve with a 2 ounce serving of french baguette bread. Of course, you could use other vegetables, and it would still be a healthy choice for breakfast. If you add things like cheese and meat, the calories would increase. To get to the Point…I will make this using real eggs…Yum Yum…and Jimmy Dean Sausage…on the side…. It is also delicious for a light lunch,if your are watching your waistline. It must be the bread that adds all the points, because a cup of Eggbeaters is 2 points, and all the vegetables are free. The bread is where the points are. When I calculated individually, it was one point less, but when I calculated the whole meal together it one point more. This is how La Madeleine serves this breakfast, you could always skip the bread.